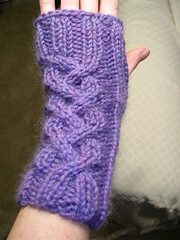 Two more people have made armwarmers from my patterns. Twisted Knitter made this lovely purple version of the One-Day Wristwarmers, and Omknitter made the Warm Braid Cable Wristwarmers, also in purple, pictured here and on her website. Wow, these look great! Thanks to both of you for trying these patterns! I love seeing what people have done with them. Thanks so much for the great pattern! I will definitely knit this pattern again.